The United Nations held a "Day of Solidarity with the Palestinian People" last week. A large map of “Palestine,” with Israel literally wiped off the map, featured prominently in the festivities. At the start of the ceremony, the dignitaries present asked attendees to observe a moment of silence. "I invite everyone present to rise and observe a minute of silence in memory of all those who have given their lives for the cause of the Palestinian people," the master of ceremonies said, "and the return of peace between Israel and Palestine." Anne Bayefsky, who reported on the event for the Eye on the UN organization, said that the ceremony's wording was aimed at giving honor to the worst of Palestinian terrorists. "It was a moment ... crafted to include the commemoration of suicide-bombers,” she wrote. Take a closer look at the map. Even if you can't read the Arabic title "Palestine" at the top (I can't, actually), the PLO flag is unmistakable... as is the placement of the map between the UN flag and a similarly-sized PLO flag, at the UN General Assembly. For the UN to deny the existence of a member-state, in the name of a group that is not a member, is not merely vile and reprehensible. It also makes a mockery of everything the UN claims to stand for. Oh, and by the way, take a closer look at the 'moment of silence' photo as well. Kofi Annan was there (front row, third from the right), and he stood along with everyone else... to 'commemorate' the murderers of women and children, Arab and Jew alike. Is this the UN's way of displaying 'moral equivalence', given Israel's increasing stature at the UN these days? If my Photoshop skills were up to it, I'd love to produce a photo of southeastern New York... with the UN building removed, and a Starbucks in its place. I'm surprised; this is more honesty than I expected. (We have certainly seen more modern maps of the Middle East, with Israel erased and Palestine substituted.) Perhaps the UN insisted on using a map from UN archives... in which case, this was the most recent map of "Palestine" that could be found. Isn't that nice? "Currently under occupation", as though this status was but a minor aberration in the historical record, with the occupiers not worth naming or otherwise mentioning. Please note, also, that "Palestine" is not defined as the West Bank and Gaza Strip territories, which is what the Palestinians publicly claim to want. No, "Palestine" here is defined as everything west of the Jordan River -- all of Israel, in other words. It's bad enough when the Palestinians claim land as theirs that was never theirs to begin with, and are unwilling to do anything to bolster their claims other than to kill people. But why must the UN swallow these fantasies wholesale? One more thought. This "Day of Solidarity With the Palestinian People" is apparently an annual event... held every year on November 29th. Why on that date? Is that the date that the Palestinian people had their land taken from them, or something? In other words, if the UN is observing the date of November 29th as the date that an injustice was perpetrated, it was an injustice perpetrated by the UN itself. Could the irony be any stronger? The United Nations, which houses the map in its Division for Palestinian Rights, has not made the map available for confirmation of its Arabic text. However, some of the words have now been deciphered and to the best of our knowledge include the following: "Palestine's Political Map, The Palestine Liberation Organization, the Center for Research, Beirut". [So] it turns out that the map was not historical at all. It was "Palestine's Political Map." And it wasn't a mere early map the UN found in a history book. It was a map which must have been produced post-1964, since the Palestine Liberation Organization (PLO) was created June 2, 1964. I think it's not quite as bad as all that -- see my comments, above, in re the date printed on the map. 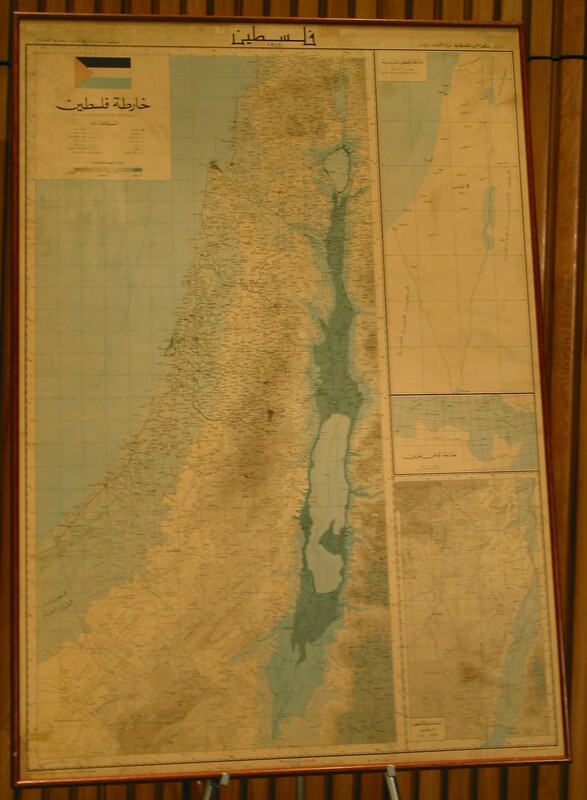 So perhaps this PLO-printed map was itself a reprinting of a 1948-era map, complete with the date. This doesn't make the UN look any better, though. On one hand, they have Israel, a member-state of the UN since 1948, and a country that has been under the tightest scrutiny -- by the UN, among others! -- for most of that time. On the other hand, they have the Palestinians, who are not a member-state of the UN at all, and who are known for playing fast and loose with the facts... in addition to being dedicated to the utter destruction of a particular UN member-state. Given that choice, whose maps would you use? If you're the UN, the choice is obvious, isn't it? And if fairness and integrity are at all important to you, the choice is just as obvious -- do the opposite of whatever the UN does.